Beyer Carpet Cleaning San Antonio specializes in carpet cleaning, tile and grout cleaning, and upholstery cleaning. Most of our work comes from carpet cleaning but occasionally we do get customers who are looking for tile and grout cleaning. Tile and grout cleaners in San Antonio charge a decent amount of money per square foot in oder to clean your tile. Beyer Carpet Cleaning is always looking to give the best price and offers price well below our competitors. 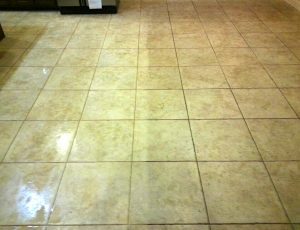 For $0.50 a square foot you can have your tile and grout cleaned for less than you think. Our technicians are trained and equipped to clean tile and grout at any time. Our tile and grout cleaning is essentially a restoration job. First an alkaline cleaner in put down and then scrubbed into the tile and grout to bring up all the junk living in your tile and grout to the surface. Once the technician is done scrubbing he will bring in the grout steam cleaner. After going over the tile with this machine your tile and gout will look like new! Most people don’t realize how dirty their tile has become over months and years. You mop or swifer your tile thinking your are cleaning and picking up everything but really you are not. You are really temporarily cleaning the surface while grease, soiling, dirty, and bacteria make their home in the grout causing it to turn colors. If your tile was once white it is probably closer to black by now. If you want a true clean and remove all the nasty things in your gout you need to hire the professionals to clean your tile and grout. Tile and grout cleaning San Antonio can be costly if you have tile in many of your rooms but Beyer Carpet Cleaning is here to work with you. Tile and grout cleaning is hard work but we are willing to offer the best price so you can get the clean you deserve. So the next time you are walking across you tile take a good look at it because chances are you need a tile and grout cleaning. Then call Beyer Carpet Cleaning because tile and grout cleaning San Antonio is what we do for the best price in town. 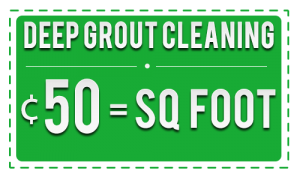 Use this coupon for your next tile and grout cleaning.